A Michael Harris Mdina Fish Head (also known as an Axe head by some) glass sculpture. Possibly one of the most iconic pieces of glass designed by the master himself. Available in a variety of colours and sizes. This is the tallest at 12" tall and the most sort after of colours. Two Mdina Lolipop pieces designed by Michael Harris for Mdina glass Malta. This desin was available in several colours. Commonly described as an end of day sculpture these were infact a designed production piece. The story that they were only made to use up the left over glass is a Myth. Available in different sizes and slightly different blue tints. Mdina goblets like the one above come in various sizes and colours. This one is signed and dated on the base to 1979. These were designed by Michael Harris. 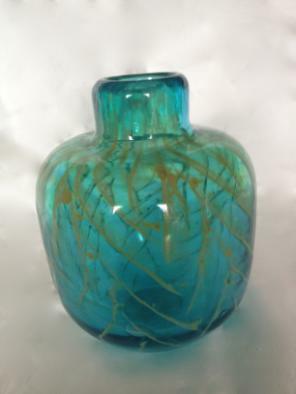 Mdina Ice Cut Vase in a rare green with blue and yellow swirl patterns. Early Mdina Brown swirled decanter. Mdina Ribbon Trailed vase in a rarer pink and blue colour. The trailed texture pattern was achieved by trailing molten glass over the vase as it was being blown. Mdina vase with the Maltese cross seal depicted on the vase just below the neck. This design was widely produced in a variety of colours and sizes. A free-formed vase by Mdina glass works signed Mdina to base This colour was produced in the 1960s and is widely seen on this shape of vase. The Mdina signature on the base is an early example of the signature. Four Mdina Obelysk. Produced in the 1970s in a variety of sizes, ranging from 3" to 12" in height. Truly stunning when on display with light passing through them. Only produced in the blue and yellow colour you see above. Below is a Mdina Bark effect early earth stone pattern vase. The bark effect vases came in a variety of colours, shapes and sizes. An early Mdina bottle vase signed Mdina to base. A 1970s Mdina Shoulder vase in the classic Blue and Yellow colour way. These were available in a variety of sizes with the one pictured being the tallest. Mdina Sea and Sand Pattern Folded sides Bottle. Above is a Mdina 17" Bottle Vase. The larger the rarer. A Michael Harris designed Mdina Bark Effect vase in tortoiseshell. A Mdina small scent bottle made with the applied blue to ruby glass technique.